It was a highly unanticipated moment in the 2016 election: the Vice Presidential debate! The two candidates, possibly the least exciting in years—selected by the least liked presidential candidates in years—went head-to-head on live television, answering the question of why they are on the right ticket to deal with America’s biggest issues. 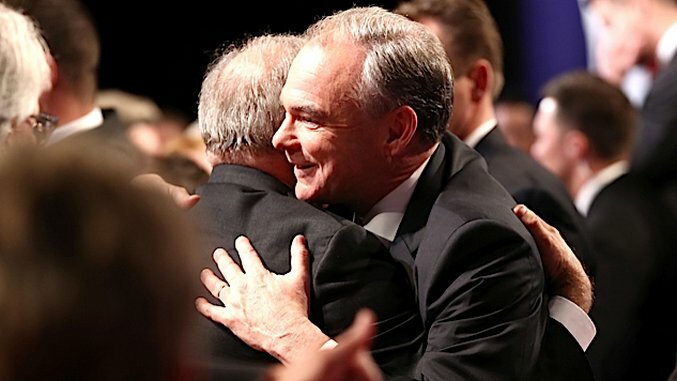 Questions about the Trump Foundation and the Clinton Foundation, personal faith, and military might took center stage as Republican Mike Pence, the Governor of the great state of Indiana, and Democrat, Sen. Tim Kaine of Virginia, went head to head in a battle of platitudes. After it was all over, the media outlets began their discussion of the highlights, and analysis of who the winner was, always questioning what, if any, effect it would have on the election. But the most notable thing about last night’s debate was not what was said or who won, but what was absent from the discussion: any discussion of campaign finance reform. In this way, the VP debate mirrored the presidential debate. Neither contained any reference to the issue. And that is truly deplorable. Since the 1976 Supreme Court decision in Buckley v. Valeo, which determined that money is a vehicle for speech, private money has been seeping into our political system at an alarming rate. The more widely known 2010 ruling in Citizens United v. FEC opened the floodgates, and allowed corporations (and unions) dumping unprecedented sums into political races. The court’s position has made enforcement of existing regulations nearly impossible with regulatory agencies unsure of where the bounds of their power lie. The effect on our political system has been chilling. Bribery is essentially legal. Perhaps the biggest issue in America right now, the outsized influence of money in politics is the root of our problems. It is the reason there is so much gridlock in Washington—different special interests can stymie legislation that affects their industry. This is why most regulation today has to come from the executive branch, which is always at risk of regulatory capture. Many regulators go on to work in the industries they regulate. Money is the reason why bills with overwhelming public support are as likely to pass as they are to fail, at least according to a 2014 study by professors from Princeton University and Northwestern University which found that the U.S. had become an oligarchy. Lawmakers in Congress spend half of their time fundraising—largely from big donors. Government has become a game of who can court the rich the most effectively, which impacts how virtually every political battle is fought. And of course, both parties play it. The fact that campaign finance did not come up in either debate is beyond astounding. It is a failure of journalism. Hillary Clinton is plagued by questions about improper dealings with political donors, while her opponent is mired in controversy regarding his political donating. Both candidates have accepted help from super PACs, and Clinton’s campaign (illegally) coordinates with them. Donald Trump was also recently revealed to have paid no federal income taxes in the early 1990’s by taking advantage of loopholes carved into our tax code at the behest of the economic elite! Surely there is enough fodder to ask a simple question! But alas, instead, just like in the first presidential debate, the issue was completely ignored. Audiences were instead tantalized by folksy appeals to faith, discussions of the national debt though investor confidence is high, and saber rattling over Russia. Politics as usual. And so the real winner last night, and so far in this Bernie Sanders-less general election is the ‘donor class.’ The loser is the American people.